Over the past two years, I have become absolutely obsessed with Ramen. I am not talking about the $0.19 dry packets that we all lived off of in College. I am referring to true Ramen, with homemade noodles and broth that is cooked for days. This obsession has rubbed off onto my husband and while we were in DC a few weeks back, he insisted on eating Ramen everyday we were there. This obsession of mine started a few years ago when I went to Seattle for a Food Blogger conference. 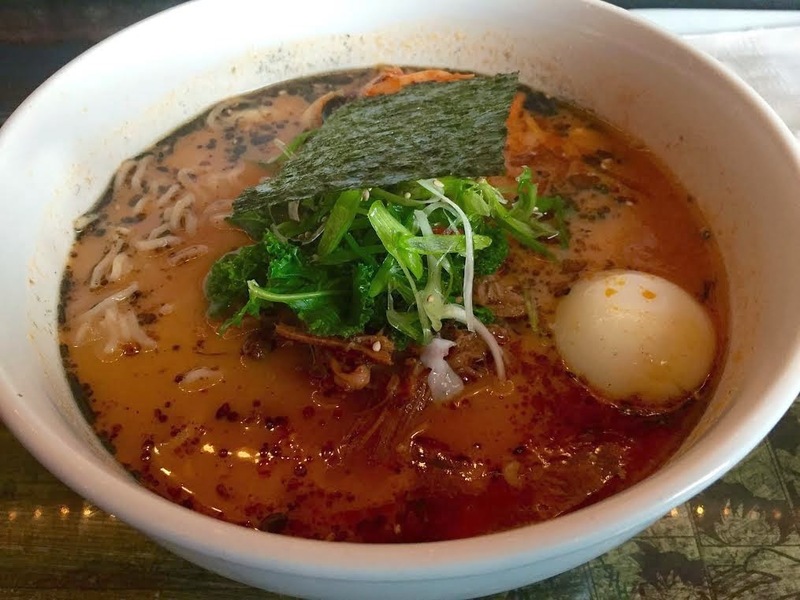 My friend Leslie is a noodle obsessed foodie and suggested we try Ramen while there. I was sold. 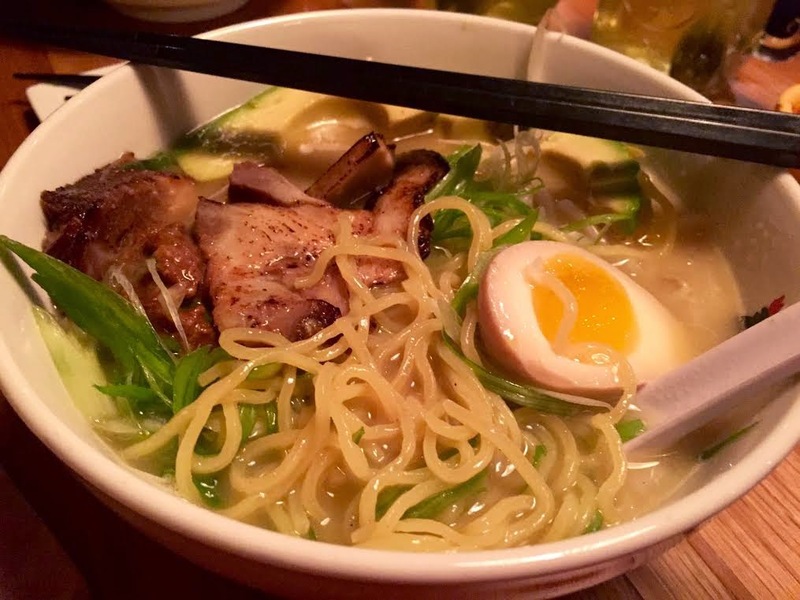 What I loved about Ramen is that you can truly make it your own by adding spice, eggs, pork, extra veggies, you name it. My husband got his first taste of true Ramen when we were in New York a few months ago for the NYC Marathon. It was cold and rainy plus I needed to carb-load. We had reservations at a fancy Italian restaurant the night before the race but I wasn't feeling it. I wanted Ramen and off we went to To To Ramen after seeing this was one of the highest ranked Ramen joints in Midtown East. I ordered the Miso Ramen and added Avocado. To this day, he will tell you this $8 bowl of delicious noodles was the best thing he has ever ate in his two trips to NYC. Then we went to DC for the Rock n Roll DC Half Marathon and I believe this is when my husband became a noodle addict. We had similar weather conditions to NYC and ran all 13 miles in the cold, wet rain. It was near impossible to warm up and all either of us wanted was a bowl of Ramen post race. Thanks to many recommendations of facebook friends, we found ourselves at Toki Underground, where I fell in love with Kimchi Broth and made it a goal to try and recreate something like this back at home. 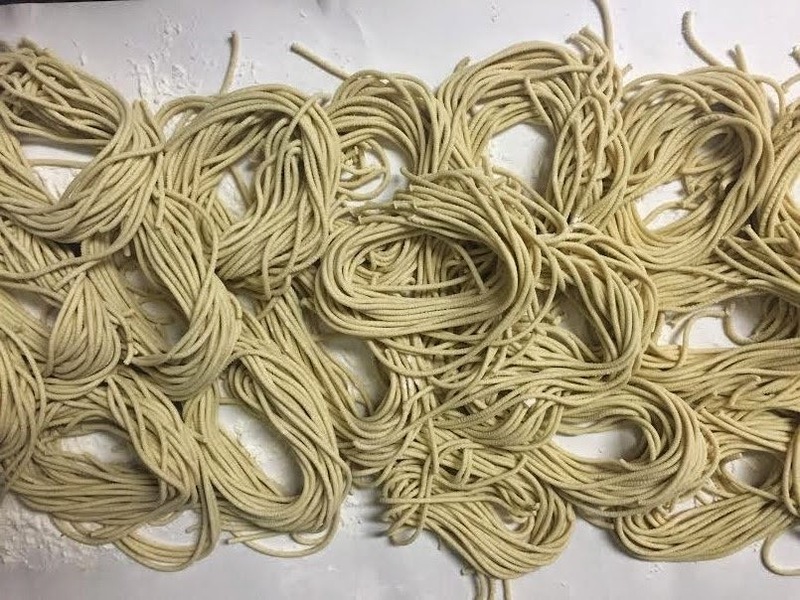 The Ramen noodles themselves are super easy to make if you have a Pasta Maker. We were very lucky to receive all of Kitchenaid's pasta attachments for Christmas this past year. Gabe's parents got us the Kitchenaid Pasta Roller Attachment while my parents got us the KitchenAid Pasta-Extruder. We used the extruder for the ramen and had enough noodles for a small army. We found a recipe on Fine Cooking which turned out perfect. Stir together the hot water, kansui, and salt in a medium bowl until dissolved. Put the flour into a stand mixer using the paddle attachment. Set your machine at level two and drizzle 3/4 cup of the kansui mixture. Scrape the sides of the bowl to incorporate any dry flour. Continue mixing in the remainder of the water 1 teaspoon at a time. Switch to the dough hook and knead by machine for 3 minutes. Remove the dough and finish kneading by hand for 2 minutes. Shape the dough into a smooth square, wrap in plastic, and let rest for at least 1 hour. If using the KitchenAid Pasta-Extruder , divide the dough into pasta balls as the instructions suggest. If using the Kitchenaid Pasta Roller Attachment (or other pasta roller), divide dough into 5 squares. Pass each piece through the rollers, starting with setting 1 and working through to setting 5. Coat the dough sheets well with flour to prevent sticking, and then pass noodles through the thin-width cutters. Boil immediately for 2-3 minutes, or wrap well and refrigerate for up to 3 days. 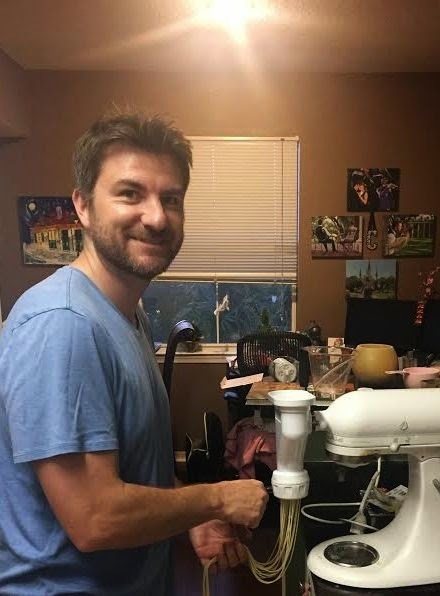 Excuse my messy kitchen / office pic above but I wanted to include something that showed the KitchenAid Pasta-Extruder in action. The not so wonderful thing about living in a condo is that my main living areas were turned into a makeshift office once I started working from home. Plus making homemade pasta is a mess. We have done so many variations of different recipes and no matter how hard I try, the photos are not attractive, so I refuse to post them. My favorite to date is a Kimchi Ramen, my attempt to recreate the broth we had at Toki Underground in DC. I used a variation of the recipe found here (I pureed my Kimchi and left out the nori). I added pork which I made in my slow cooker, saving 1 cup of the broth it cooked in and added it to my Kimchi broth.